While a very early version of Cinderella printed in China in the ninth century, has been known to the world since the translations and commentary by R. D. Jameson (1932) and Arthur Waley (1947 and 1963), there has been no extended analysis of this Tang Dynasty text in the light of its Asian religious, historical, and literary contexts. The story of a young girl, Yexian , appeared in the miscellany of the Tang Dynasty Duan Chengshi (c. 800-63) (Reed 2003:3-5). Upon examination, the Yexian narrative is remarkably close to the story made most famous by the Frenchman Charles Perrault (1697) and the 1950 Walt Disney cartoon. 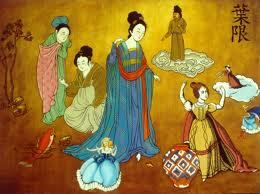 A mistreated stepdaughter is kind to an animal; at the moment she is bereft of hope, an otherworldly person appears out of the blue; a marvelous dress for a festival and a shining lost shoe lead to identification through the fit of the shoe and marriage to a king (see Appendix A for a translation of the Yexian story). Despite the fact that the Cinderella and Yexian stories are parallel in spirit and series of motifs, recent scholars interested in the story’s diffusion, such as Graham Anderson, disregard the Asian roots of the story, and instead trace a few motifs back to other stories told by Greeks about Egyptians (Anderson 2000 and 2003). While the Tang Dynasty text adds a highly unusual fish with red fins and golden eyes to the story famous in the West, Yexian herself demonstrates familiar character traits: she is hardworking, virginal, kind, lonely, wishful, and willful. It is time for this heroine’s Asian identity to be recognized and the evocative story motifs understood in their Asian contexts.